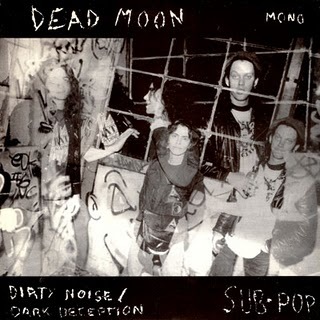 Ritual Room: Single: Sub Pop Edition #29 Dead Moon - "Dirty Noise / Dark Deception"
Single: Sub Pop Edition #29 Dead Moon - "Dirty Noise / Dark Deception"
Dead Moon somehow always managed to produce some of the catchiest and dirtiest sounding rock music, even on a label that prides itself (or used to...) on dirty sounding music. Here's a single that was released in '93 for the singles club containing 2 tracks that manage to be both ominous and fun. Thank you so much for posting these sub pop singles. Would you happen to have the following? I've tried posting this comment using my blogger id but can't for some reason.